Basil (Ocimum basilicum) is popular herb for good reason, as the aromatic leaves, either fresh or dried, make many good culinary dishes taste even better. With its bright green foliage, basil is an attractive plant that can thrive outdoors, or planted in a container that you can bring indoors for the winter. Basil is a sturdy herb that isn't difficult to keep alive so long as the plant's few simple demands are met. Plant basil where the plant will get a minimum of six to eight hours of bright sunlight every day. Be sure the soil drains well. Although basil appreciates moisture, the roots will rot in soggy soil. Keep the soil evenly moist, as lack of water causes water stress that can eventually kill the plant. If basil is planted outdoors, water it deeply, saturating the soil every seven to 10 days, unless it rains. Check containerized basil daily, as soil in containers dries out quickly. The soil should be moist at all times, but never soggy. 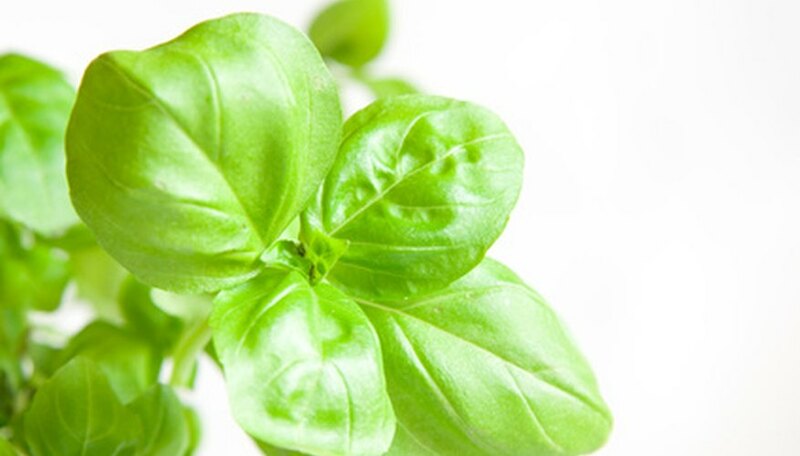 Fertilize basil sparingly as too much fertilizer can burn the plant and can minimize the flavor of the herb. Fertilize the plant every four to six weeks, using a regular liquid fertilizer mixed to half of the strength recommended on the label. Feed containerized plants the diluted solution every three to four weeks. Spread 2 to 3 inches of mulch around the plant to retain soil moisture and minimize weeds, as weeds compete with the plant for available moisture and nutrients in the soil. A mulch such as shredded bark, dry grass clipping or pine needles works well and adds nutrients to the soil as the mulch decomposes. Trim the basil plant for use as often as needed. Trimming results in a healthier, more succulent plant. Allowing the plant to grow without trimming results in a tough, woody plant with a bitter flavor. Don't allow the plant to flower and go to seed. Dig in-ground basil plants, pot them and bring them indoors for the winter, as basil won't tolerate frost. Plant the basil in a sturdy container filled with commercial potting soil. Basil requires good drainage, so select a container with a bottom drainage hole to avoid rot. Place the plant in bright sunlight during the winter, or place it under a grow light for 12 to 14 hours each day.